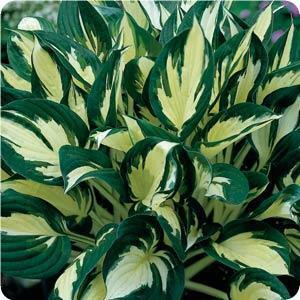 Description: Fire and Ice Hostas have variegated heart-shaped leaves. The inner color is white with a dark green margin on the outside. In midsummer they sprout lavender bell-shaped flowers on tall sturdy stems high above the plant. Hostas are extremely popular, hardy herbaceous perennials grown primarily for their beautiful foliage. They are easy to grow, shade-tolerant plants. The plants are low maintenance. Hostas originally came from Japan, China, and Korea. They were first introduced to Europe in the late 1700s and then came to the United States in the middle 1800s. Outstanding Features: Fire and Ice Hostas have twisted leaves. Tips: Prefers areas with full shade and plenty of moisture, but not standing water.